One of my favorite things about loving horses is connecting with other people that love horses. It gets even more fun when you both have a child (er, horse) and you get to share the experience of riding him/her with your fellow horse-obsessed friend. I love seeing my baby (uh I mean Rio) spread his wings and experience another rider. MM and I swapped rides last night- she owns Rio’s long lost brother/bestie, Scottie. See the photo story of Rio and Scottie’s bromance here. Swapping horses with a fellow rider has its ups and downs though. On one hand, it’s so exhilarating to see Rio looking so good with another rider. I felt so proud seeing him behaving and looking so fancy. I can see the innumerable hours of work I have put into him really paying off. On the other hand, seeing another rider struggle with the same things I’ve been struggling with lets me know that we still have a lot of work to do. I want him to be an easy, enjoyable ride for anyone who gets on him, so seeing him struggle in the canter just further proves we have a long road ahead of us. MeganScottie7.24.17 from Kelly on Vimeo. Scottie was such a BLAST to ride. MM has spent a really long time on his flat work, and it shows. He rides so nicely off your seat, and is incredibly soft to the hand, but not in an evasive way. He keeps a lovely feel of the outside rein, and stays soft to your inside rein. you can collect his canter off your seat alone, without feeling like he could break gait at any moment (which is how Rio feels when you try to collect his canter). MeganRio7.24.17 from Kelly on Vimeo. So what about you guys? Love letting friends ride your horse? Hate it? while i can appreciate the pride that must accompany watching your horse go well and demonstrate the fruits of your schooling labor….. i’m very much that spoiled little child who doesn’t like to share her toys haha. is that terrible to say? idk. so far tho, i’ve kept charlie for myself lol. 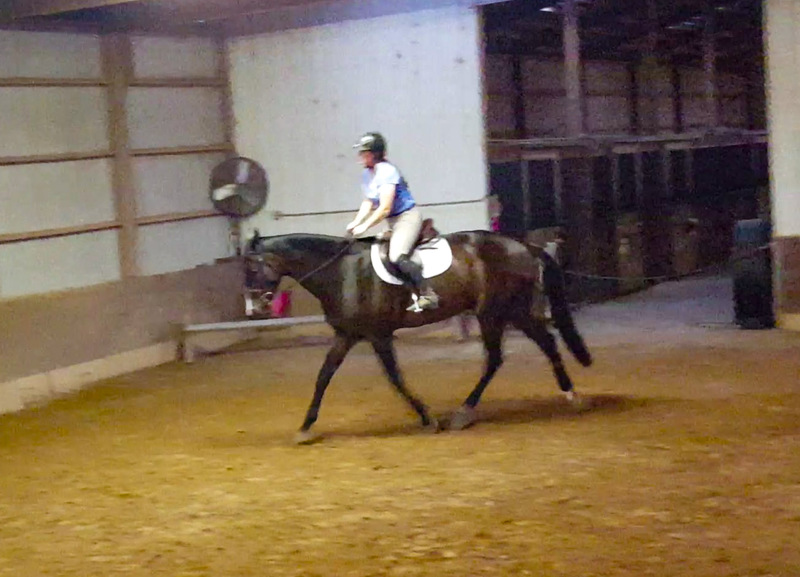 there were times tho where i had other ppl get on my last horse, and in fact eventually placed her in a lease situation with a young rider – and i will admit, it was very satisfying to watch the new rider start figuring the mare out. 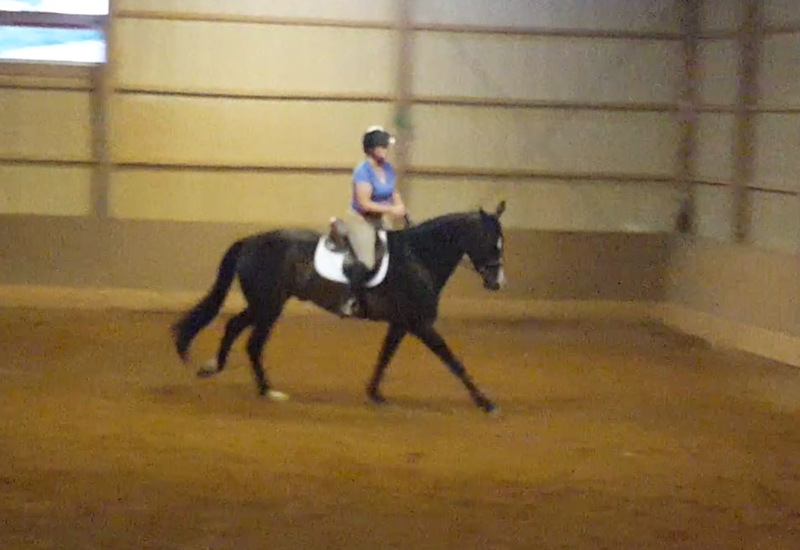 I am just so excited that my horse is at a point where other people can ride him and they actually have fun doing it! He developed a bit of a reputation for being difficult before I owned him, and one rider has ridden him both pre- and post-me, and she says he feels so different, in a good way. That makes me happy. That’s so great! Must make you feel good to know you’ve changed him for the better 😊. I’m excited to get more training on Rio and have my mom ride him some day- she still trail rides my retired horse who is 29! I actively encourage other (trusted) people to ride my horses – not only do I think that it’s good for the horse to be ridden by more than one person, but I also like to watch!